you've all marked your calendars right??? Currently, most fundraising comes from the 7th on the 7th campaign. While that is hugely successful, the fact of the matter is - without more help - we cannot help all of the families who seek assistance. 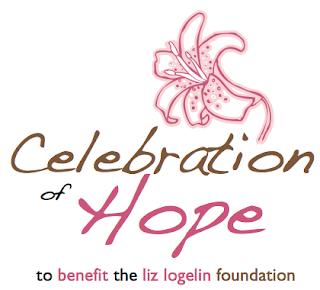 Last year, in it's first year of inception, the Liz Logelin Foundation was able to give grants to 35 families in need. Wouldn't it be nice to offer some sort of help to every family who applies? Celebration of Hope benefiting the Liz Logelin Foundation - Taking place downtown Minneapolis at Solera Restaurant - with the live music of Tim Mahoney!! this is shaping up to be a GREAT night! The 5k you've ALL been training for...(you have right?) Well, I know a lot of you have! Again - a can't miss event! We had hundreds of walkers/runners last year...what a FUN event! This year will be bigger and better than ever! So...other than mark your calendars...What can you do? Well, what about making a donation for the silent auction? We are currently seeking new items that we can use to auction off either via live or silent auction or via internet auction. It's a great chance to donate to a worthy cause while showing off your business with a gift or gift certificate in the silent auction! What about sponsoring the 5k? Do you or someone you know have a business that would benefit from the exposure of hundreds of 5k participants? A vast majority of them bloggers? Behold - the power of the internet - getting in front of that many bloggers is simply priceless! but what it boils down to is this...5 different sponsorship levels ranging from $125 up to $1500. 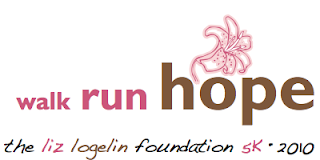 Want to promote your business and help out the Liz Logelin Foundation in the process? Just $125 gets your name on the official 5k t-shirts! $250 gets your logo on the shirt! Question...if I have a million little mouse ornaments or a lamp shade with an interesting odor can I donate them to the auction? Hmmm - interesting question. Thank you for inquiring. At this time, I'm going to have to say no. Currently, we are seeking items in BRAND NEW condition. Items that are New in Box - Never Been Opened, unused gift cards, or maybe hand made items that a person might find in say, an etsy shop. As for your previously loved treasures - please hang on to them as we are tentatively planning a charity type garage sale where people will be able to donate anything and everything with all proceeds going to the Liz Logelin Foundation. Thanks again! Read about this last year. Here's to actually getting involved this year!